It took me nearly two weeks to change my location status on Facebook from London to Oxford. Moving from such a huge place to such a small one (at least that’s how it looks to me) can be overwhelming and I do admit that it was for me too. But with this post, I am embracing my new life here in Oxford and giving you just a taste of what this picturesque town is like. 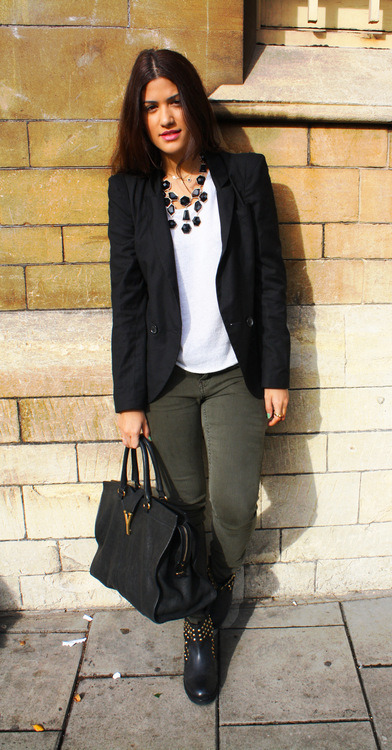 As for the outfit I went with my new khaki jeans and studded boots. 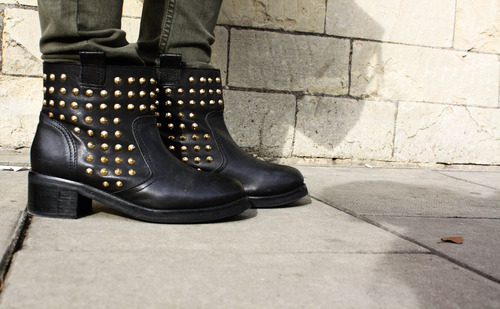 Just like everyone else I am falling into the trap of studs/spikes that is literally EVERYWHERE this season. My advice to you is to not overdo it with studs or spikes. I would go for a studded purse or shoes rather than studded jumpers/shorts/shirts or even t-shirts. I think it makes more of a statement this way! Here, I’m styling the outfit with a blazer for a more chic look, a fur vest for a more casual ensemble and a third option wearing both the blazer and the vest for those ones that can’t handle the cold winter days easily.